"Well, that doesn't look right," you say as you stand in the abandoned ruins of medieval Paris, with a hundred thousand rotted skills piled up on a mountain before you. Your partner draws her pistol and checks the historical record on her holographic tether. "Looks like the Khan didn't die of alcoholism, and his hordes didn't stop at Vienna," she says. 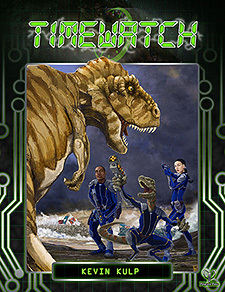 You are agents of TimeWatch, defending the timestream from the depredations of radioactive cockroaches, psychic velociraptors, and human meddlers. Go back in time to help yourself in a fight, thwart your foes by targeting their ancestors, or check out a scroll from the Library of Alexandria. Just watch out for paradoxes that may erase you from existence... or worse. If you've ever dreamed of going on world-changing adventures from the age of the dinosaurs to the end of the universe, this game is for you. Fourteen settings where you can face Mythos horrors, slide between alternative universes, steal the treasures of the ages and more. More than a dozen ready-to-play time seeds, iconic pre-generated characters, and three full adventures. Plenty of options, so you can easily customize the game to match your group's preferred style of play. You've got a time machine, high-powered weaponry and a whole lot of history to save.